Details relating to the Portuguese Commemorative of 2018. The coin commemorates the founding of the National Printing Company which occurred 250 years ago. The National Printing Company publishes the Portuguese Official Gazette with all the legislative measures of the country as well as books of the highest cultural value and other cultural works. The designer of the coin is Eduardo Aires whose name appears in small print on the edge of the inner circle between seven and six o’clock. The mint mark “INCM” appears on the edge of the inner circle between six and five o’clock. 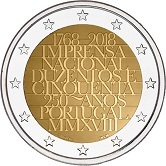 From Portuguese Commemorative 2018 to euro coin collector.